It's two days after the midterm elections, and there are still a few things unknown about the outcome. There are several House races and a handful of Senate seats still up in the air, along with two high-profile governors races in Georgia and Florida. *Only 88% of precincts are reporting and ranked-choice votes need to be reallocated. There were two independents who ran, who were seen as liberal. Combined they earned more than 22,500 votes. Full election results can be found here. Maine's 2nd district race, profiled here, has one of the oddest potential outcomes — the Republican incumbent is leading, but a newly implemented way the state counts votes very well could hand the race to the Democratic challenger. Republican Bruce Poliquin currently leads Democrat Jared Golden by 921 votes with 46 percent of the vote. But there were also two independents in the race, Tiffany Bond and Will Hoar. Under Maine's unique ranked-choice voting law, if no candidate receives a majority, that is 50 percent plus one of the vote, the Maine Secretary of State conducts a recount. The last-place finisher in the contest, who appears to be Hoar, will be eliminated. The second choice his voters listed on their ballots will be awarded to the respective candidates. And if that still doesn't produce a majority winner, then the third-place finisher is eliminated and the process repeats. Golden has said he will abide by the final results, but Poliquin didn't answer a question put to him during a debate last month about whether he would. It's possible he could decide to file a court suit to contest the process. So it may be a while before we know who will represent the voters on the largest congressional district geographically east of the Mississippi. The uncalled governor's races are in Florida and Georgia. In Georgia, Republican Brian Kemp holds a narrow lead over Stacey Abrams. 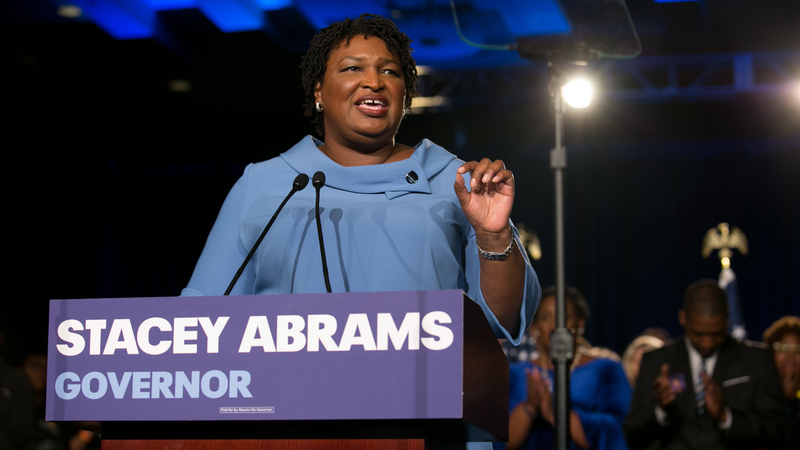 Kemp has declared victory, but Abrams has yet to concede, contending there are thousands of absentee and provisional ballots yet to be counted. In Florida, The Associated Press has called the race for Republican Ron DeSantis over Democrat Andrew Gillum. While Gillum has conceded, the race is tightening and could still be subject to a recount, if the margin ends up less than 0.5 percentage points. It's currently 0.7. The same holds true for Florida's U.S. Senate race, where Republican Rick Scott has a narrow lead over Democratic incumbent Bill Nelson. That race is currently within the margin for a recount at 0.2 percentage points. The Arizona Senate race is also up in the air. There, Republican Martha McSally has a lead of some 15,000 votes over Democrat Krysten Sinema, but some 600,000 mail-in ballots have yet to be counted, a process that could take a week or more to complete. Finally, the special election for a Senate seat in Mississippi goes to an automatic runoff between the top-two finishers, Republican Cindy Hyde-Smith, who was appointed to the position, and Democrat Mike Espy. That will take place on Nov. 27th.